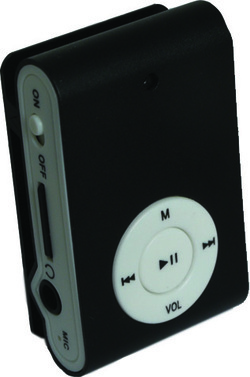 The size of this gadget is mind boggling considering that it is not only a hidden camera, but also a fully functional Mp3 player— it is only slightly larger than a quarter. Immediately play back the Mp3 files off the SD card anytime with the device's simple play/pause, backwards/forward navigation. Supports up to 16GB MicroSD cards. Dimensions: 1.1" x 1.6" x 0.5"